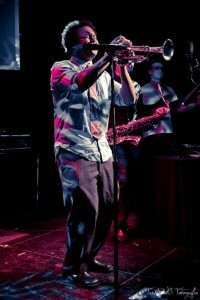 Kafele Bandele, trumpeter, composer and producer, has been playing the trumpet for approximately 15 years. Born in Baltimore, Maryland and raised in Baton Rouge, Louisiana, Kafele was first exposed to jazz by his parents. In fact, he attributes his love and appreciation for the art to his father who often played John Coltrane, Freddie Hubbard and Miles Davis among others. Later, his brothers and sister introduced him to Hip-Hop and R&B. This musically enriched background provided the influences that helped cultivate his unique sound. While attending Southern University in Baton Rouge, Louisiana he studied Jazz Music Theory under the leadership of world-renowned jazz artist, composer and educator, Alvin Batiste. During this time, Kafele was also establishing a reputation by performing at various venues in Louisiana, Georgia, Texas and Alabama. He collaborated with a group of talented musicians to form The Kafele Bandele Group. This group frequently performed at M’s Fine and Mellow Café in Baton Rouge. He also appeared at the Baton Rouge Blues Festival, House of Blues in New Orleans and internationally acclaimed New Orleans Jazz and Heritage Festival. After earning a degree in Physics from Southern University, Kafele moved to Chicago with plans to expand and elevate his musical career. Following years of hard work his plan is taking off with an untamable force. This year Kafele officially launched K. Kapano Records, Inc. in which he plans to elevate his own musical career, produce other talented artist, and perpetuate the appreciation of jazz and hip-hop. Already, he has released his debut album, “Prodigal Moon” which introduces a new genre of music that infuses spontaneous trumpet riffs with pulsating, hypnotic baselines. He calls this music Cool Fusion-a poetic entanglement consisting of the finest elements of jazz and the richness of Hip-Hop. The Wild Hare (Opening act for Slum Village), Isaac Hayes, Rhythm, The Cotton Club, The District, The Hot House, Tin Lizzy, Harry’s Velvet Room, Reunion and A Touch of the Past. He also has performed at poetry readings in Chicago and New York and has been featured on various college radio stations including Louisiana State University’s KLSU and Columbia College’s WCRX, here in Chicago.